Today when I was out feeding my bees in preparation for winter, I noticed a hint of crispness in the air around me. It started me thinking about the snowy winter days right around the corner. When school is out for snow, or just on a blustery weekend, I like to build a fire and enjoy leisurely breakfasts with the family. A frequent guest is homemade buttermilk biscuits with some fresh berry jam. So, today I bring a Wicked Good recipe that is surprisingly easy to make. In an ideal world I would be able to pick strawberries, blackberries, and raspberries from my garden for this recipe or at least freeze them when in season for later use. However, life is not always “ideal.” This year my strawberries didn’t produce as much as I would have liked so the pictures you see used frozen organic berries and fresh blackberries/raspberries. I actually liked the frozen aspect of the strawberries better than fresh. They were mostly thawed; but, still had a bit of resistance in them. This made them a bit harder to mash; but, yielded a consistency and texture in the jam that was awesome! I acknowledge a high sugar content may not be the “healthiest” but at least we are getting our antioxidants! Makes me look forward to those wintery days ahead. . .almost. . .lol! Two big stockpots. One for making the jam and one for the water bath to process jars. 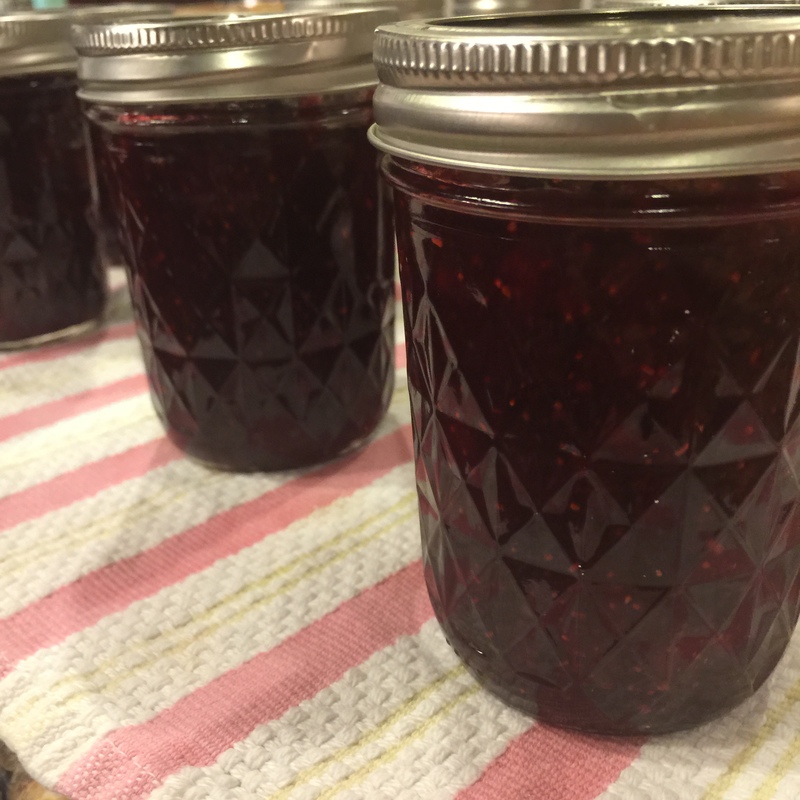 canning supplies: About 8 half pint jars (you can use bigger or smaller. I choose these because they are a great size to give multiple servings but not so much we are having to eat a ton in order to not waste it), lids, rings, a funnel, jar lifter and rack for the canning pot. food mill to deseed blackberries (if you don’t care for the seeds) and mash (not deseed) raspberries. This is optional. Pectin– one package. You can choose regular or no-sugar pectin. . but this recipe calls for sugar with both. You will use less if you have the no-sugar pectin but some is still there. Can’t help it. I am a Southern girl and we like it sweet! 🙂 Besides, if you try a true no sugar recipe your likely to have trouble getting the jam to set well. That being said. . .if any of you know how feel free to share in the comments! I love to learn new ways of doing things. Sugar– if using the no-sugar pectin you need 4.5 cups of granulated sugar. 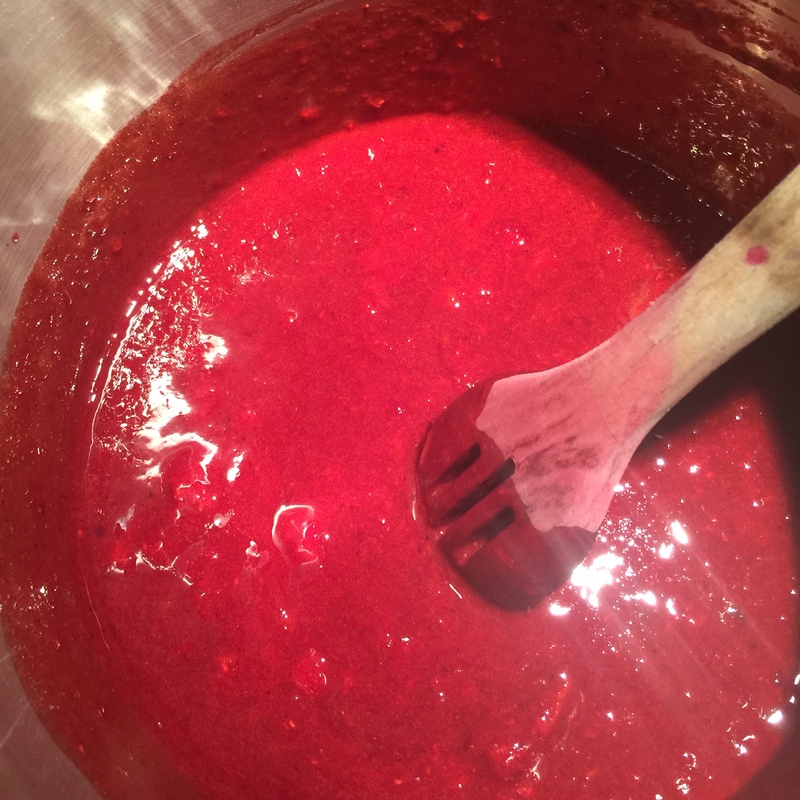 If using the regular pectin–which I did– you will use 7 cups. 4 cups of slightly crushed strawberries– you are not measuring the pre-crushed berries but the berries once crushed. 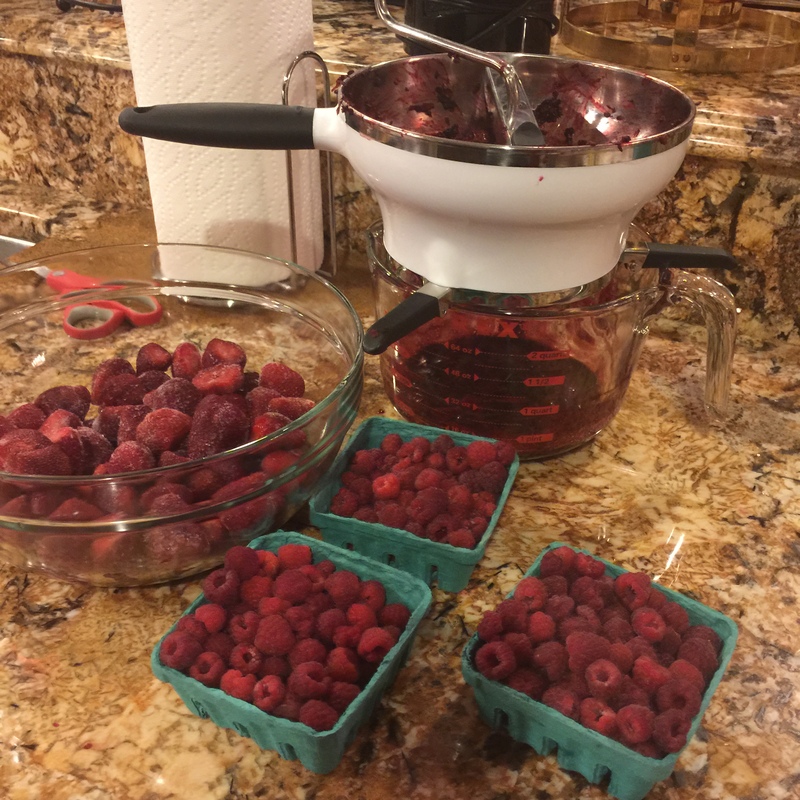 1 cup of mushed raspberries –it takes about 2-3 pints of fresh to get this. 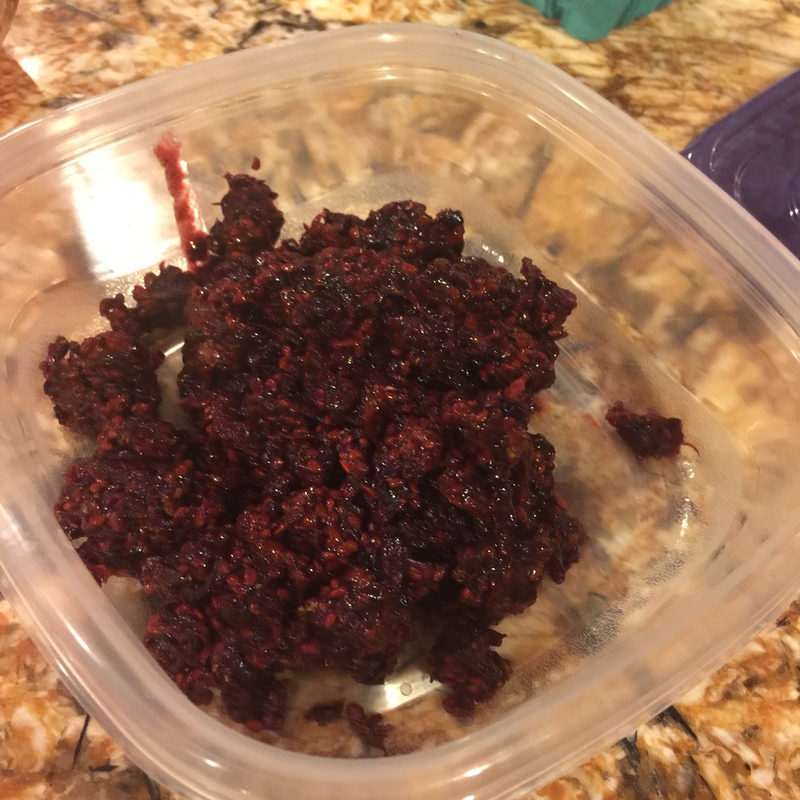 1 cup of mushed/deseeded blackberries–it takes about 2-3 pints of fresh to get this too. If you are using fresh try to get about 2/3 really good and ripe but not soft and 1/3 a bit under ripe. This helps with getting enough pectin to set the jam well. Either wash your jars in the dishwasher and leave them in there to stay hot or place them in some lightly simmering water to heat them up. Warm you lids if you choose to do so. This step used to be required to help ensure a good seal. Now the lids have improved and the step is considered optional. I still do it because I am super cautious and would rather be safe than sorry. But don’t feel you have to follow my Type A way. If you do though just warm the lids. . don’t bring them to a boil. Once the water is warm turn off the heat and let them sit there until needed. If you like to deseed your berries now is the time to set up the food mill. I like to get the seeds out as much as possible so this is the way I go. You see in the picture that I set the food mill above my glass measuring cup. I do this both to save utensils I have to later clean; and, to help me get the measurements correct on the juice. It is VERY important to have exact measurements with jam. You need 6 cups of juice per batch. By deseeding my berries over the measuring cup and I can see exactly when I have enough and none is wasted. 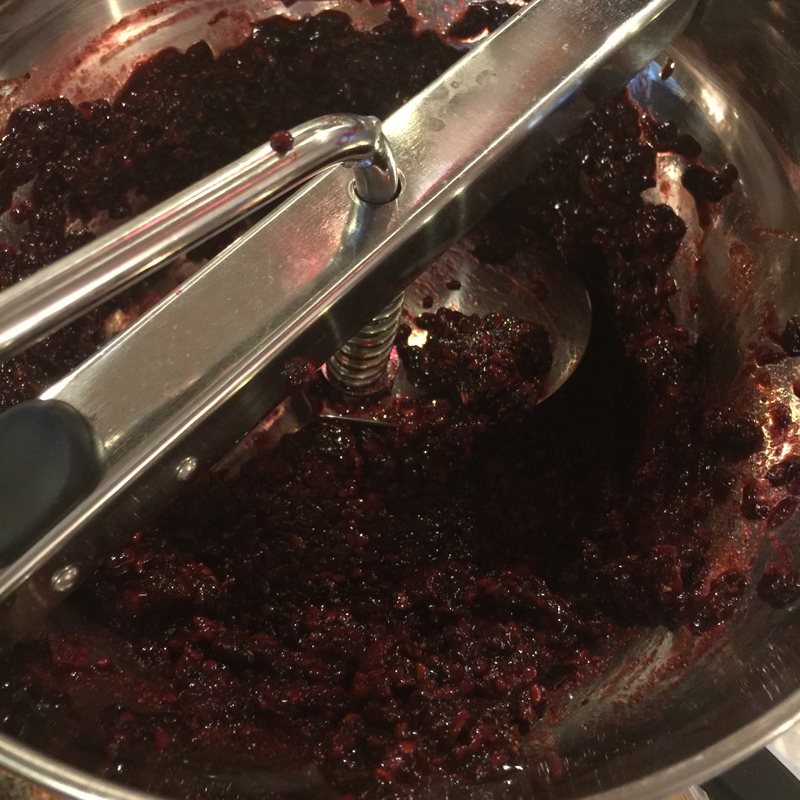 Put about a pint of blackberries into the food mill and crank away. The juice will run into the measuring cup and the seeds/pulp will stay behind. Don’t worry though. . .I have a recipe for these “remains” to make a delicious blackberry syrup that is decadent over ice cream. You want to get as much juice out as possible. The picture above shows blueberries with a bit of juice left in them. When the remains are not very “wet” looking and stick together you are done and can add more berries to work through the mill. Here is a picture of seeds/pulp once the juice is mostly removed. Remember to periodically scrape the bottom of the food mill. I have had almost 1/8-1/4 cup of juice that just “hangs out” there clogging up the system. I also periodically stop and scrape the sides to force more berries under the paddles. 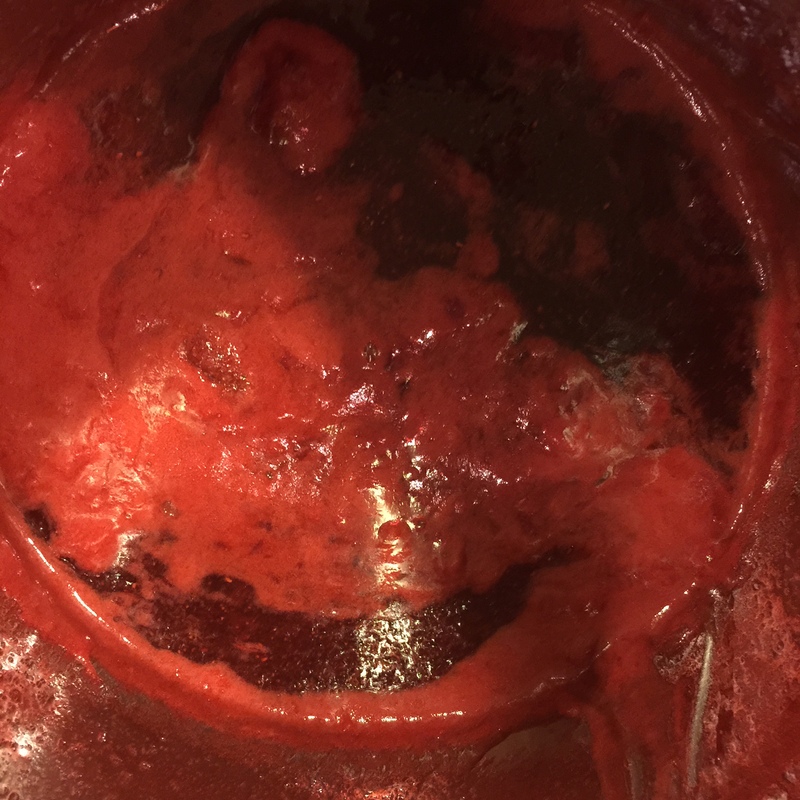 Finally, you will want to remove the remains when it gets too full to be extracting juice. You can either save these for that syrup I mentioned or offer to the compost Gods. Once you have two cups of juice you are done with blackberries. Repeat step 4 with your raspberries until you have added one cup of additional raspberry juice to the mixture. The point here isn’t to remove seeds but I think the food mill crushes great, helps to release needed pectin, and gives more juicy flavor. I get the needed texture from the strawberries. You should now have three cups total of juice. Crush your strawberries to the texture you like. The chunkier the berries the chunkier the jam will be. Personally I like some texture so I like berries with a bit of “frost” still on them and barely crush. 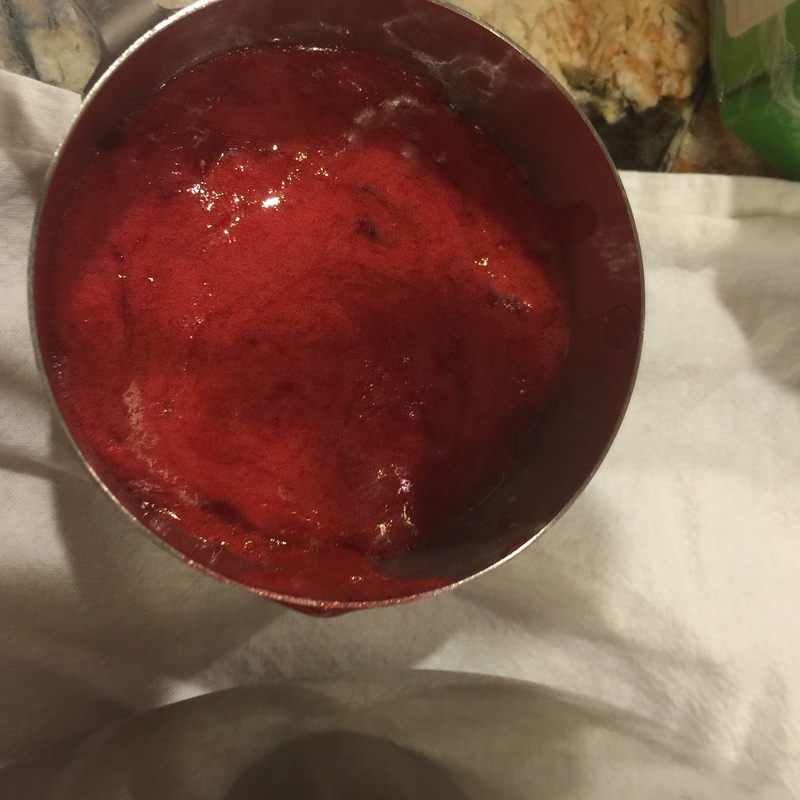 Keep adding crushed strawberries until you have a total of 6 cups of juice/berries. Pour the juice mixture into a big stockpot and sprinkle a box of powdered pectin over it all. While stirring it well bring to a boil– this will take about 5-10 min. There will be some lumping of the pectin but if you stir well it will dissolve and work in. You want the mixture to reach a full boil–as in it can’t be stirred away. Add sugar. Notice the beautiful color change in the picture above once sugar was added. Mmmmmm. 🙂 7 cups if you use regular pectin and 4.5 if low or no sugar pectin is used. Bring back to a boil while stirring to prevent sticking and boil hard for one minute. You don’t want to overcook–so once it’s boiling only let it go for one minute. But if you bring it slowly to that boiling point you will be ok and reduce the foaming. Don’t get to worked up about this though. Usually I am in a bit of a hurry so I just live with needing to scoop a bit more foam. 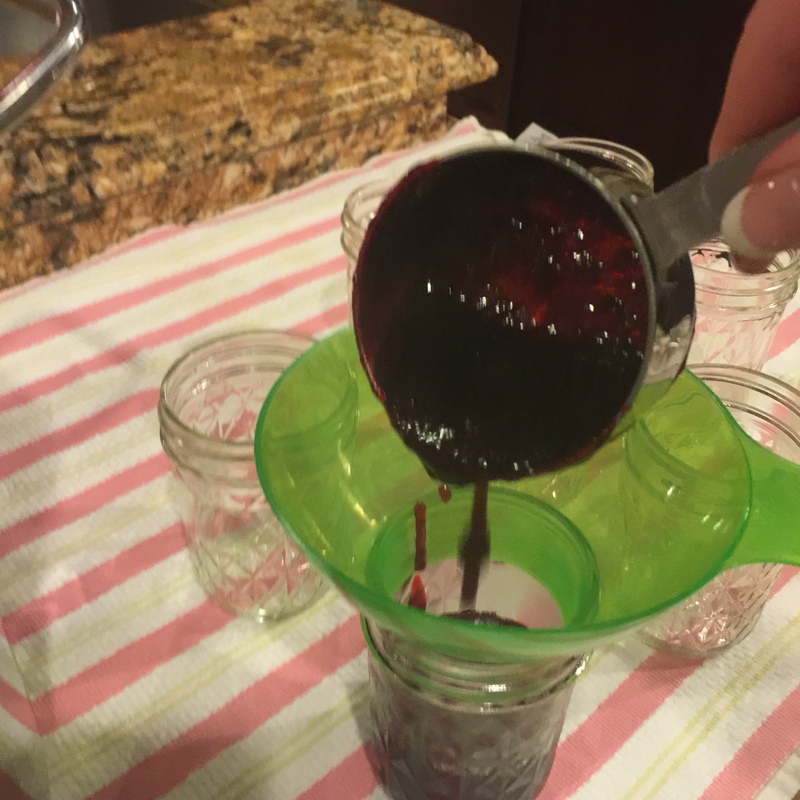 Test for “jell.” I take a metal spoon, fill it halfway, and place some jam into the freezer for about a minute. It it’s the consistency I like great. If it’s runny add a bit more pectin and bring to a boil for another minute. 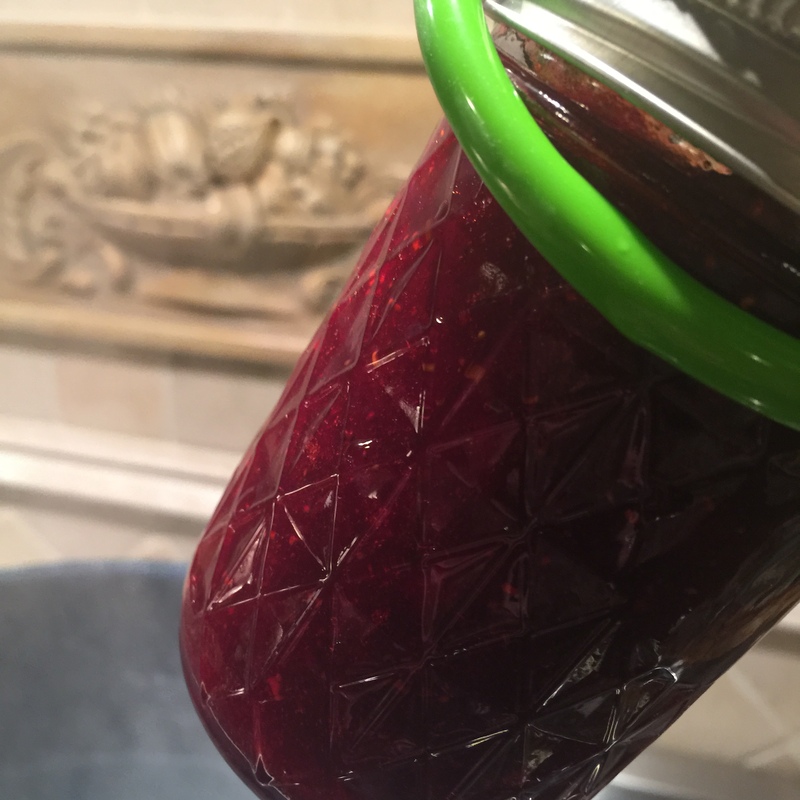 Give the jam one last good stir to move any berries that have risen to the top throughout the jam. Using your funnel to keep it neat, ladle the mix into your hot jars leaving 1/4-1/2 inch headroom. Wipe rims and threads so nothing gets in the way of a good seal, center lids and screw on bands fingertip tight. This means firm but not so hard you couldn’t unscrew them easily. You should have about 8 half pints. Either place your jars in a rack and carefully lower into boiling water or use a jar lifter to lower the jars individually. Let boil 10 minutes if your here in Leesburg, VA. If you are in a higher altitude you will add time. Generally it shouldn’t matter unless you are above 6000 feet above sea level where you would process 15 min. If in doubt check the pectin instructions for specific process times. Remove jars and enjoy the “pops” that sound a good seal. They should sit 12-24 hours before putting in the pantry. Another test for a good seal is after cooled–press on the center of the lid. Iffy there is no “give” you are good to go! 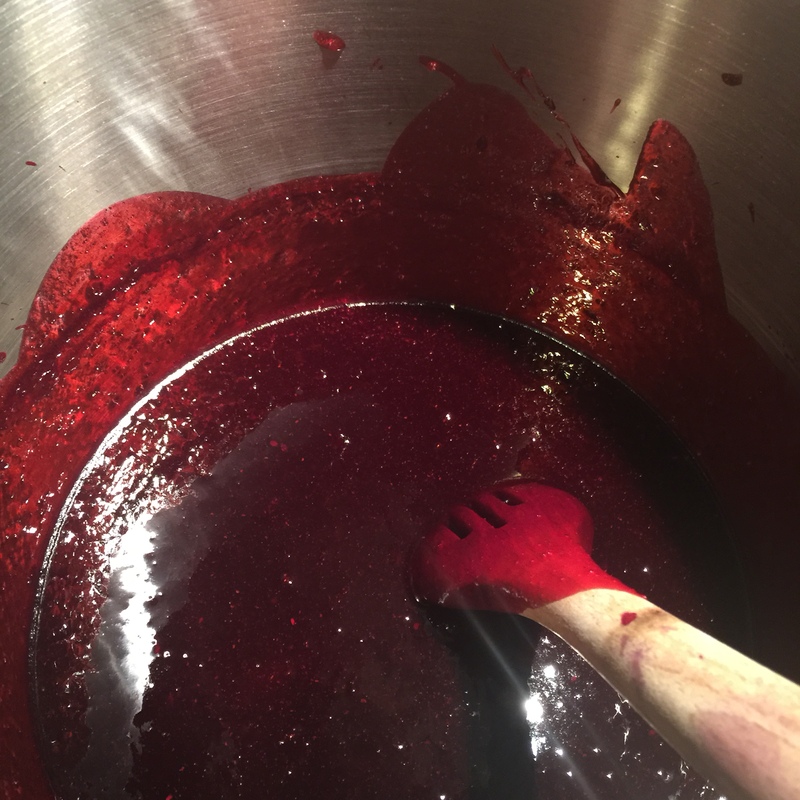 Jams should give a year of lasting fresh berry goodness but you might detect some lessening of flavor after about the 10 month mark. This is rarely a concern though because these are too good to last that long! Bon appetite! Mmmm. 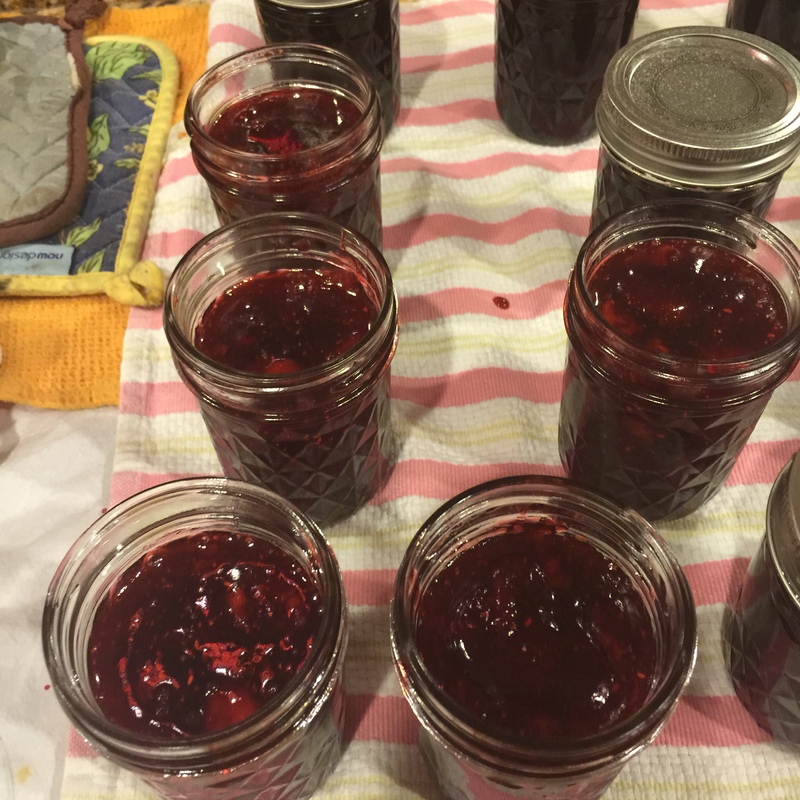 I made from raspberry-rhubarb jam the other day. All this stuff is so divine.